Fragrant, spicy, tasty: mostarda is a very appreciated preparation in Italian cooking as accompaniment for cheeses, meats and desserts. Which is its original recipes? Fruit, sugar and mustard essence: a very simple mix of ingredients, which today is still unchanged, even if its recipe has been adapted to the local traditions of many Italian regions. The history of mostarda dates bake to the sixteenth century, when the peasant families used to prepare it to preserve the fruit longer. The recipe of mostarda was born with a very specific purpose, only later on people decided to prepare it to enjoy its very peculiar taste, sweet and spicy at the same time. The most classic mostarda is the one with quinces, prepared since a long time ago in the Italian northern regions. Veneto is the area richest in quince trees because they grow spontaneously, that’s way quince mostarda is traditionally called Mostarda Veneta. Venitian mostarda is just one of the many versions spread all over the Italian regions over the centuries. Mostarda of Cremona is as famous as the venetian version, it is prepared with mixed fruits whole or chopped in big chunks. The most part of mostardas are made with whipped fruit, which – once combined with glucose syrup and mustard seeds extract – produces a silky preparation. The Mostarda Mantovana is made with campanino apples, which are very small and they taste slightly acidic, the Mostarda Piemonteste (also known as “Cougnà”) is definitely the sugariest, since it is prepared with must. These are the three most famous mostardas, but there are really a lot of mostarda varieties all over Italy: the Mostarda di Voghera, similar to the cremonese one, consists of whole fruit soaked in a mustard-flavored syrup, making this preparation less spicy than the cremonese one. There are also many other mostarda versions with whipped pulp, prepared with quinces, pumpkins, grapes, cherries and many other fruits, sometime also with vegetables. The preparation of mostarda consists of many different steps, to be carefully accomplished in order to obtain a perfect product. Let’s discover the classic mostarda recipe, since this preparation is the base for the most part of fruit mostardas and it can slightly change depending on the result we want to obtain. What do you need to prepare mostarda? These are the basic ingredients for every preparation, you can add spices or vegetables as you like depending on the taste you want to obtain. The first step to prepare a homemade mostarda consists in peeling the fruit and cut it into medium size chunks. Put them in a bowl and add sugar to completely cover the fruit, let sit for 24 hours. Catch the juice produced with the maceration process, transfer it to a saucepan and bring it to a boil: repeat this process three times, always letting the preparation sit for 24 hours. Then add mustard: depending on anyone’s taste, it is possible to add only mustard essence or mustard seeds, which will give a spicy touch to your recipe. Finally, let the preparation cool down and pour it into jars. In Italian cuisine mostarda is used as accompaniment to enhance the typical local products, in particular cheeses and charcuterie. It can also be paired with many savory or sweet dishes, from the most traditional ones to the most unusual. Traditionally mostarda is served with boiled meats, especially with the fattest and richest meat cuts: tongue, cotechino, chicken, calf’s head or capon. Another traditional paring consists in serving mostarda as a condiment on cheese boards. Pear mostarda matches perfectly with many mature or marbled cheeses, some other kind of mostarda – which have a sweeter taste – are normally eaten with fresher cheeses. That’s not all! Mostarda is also used as condiment or accompaniment to food, distancing itself from the traditional pairing and landing on the innovative cuisine. Not just cheese and charcuterie: mostarda starts to enrich other dishes such as pumpkin tortelli, gorgonzola crêpes, fish carpaccios or tartare. Experimenting with food, creating brand new contrasts and tastes. The mustard-flavored syrup of fruit mostarda can be transformed into the secret ingredient to enrich a new sauce. How to? You just need a fruit preserve, some onions, sugar and the species you like, mix these ingredients and add the syrup. The result will be a sweet and sour sauce with an agreeable spicy taste, which will match perfectly with a good pork roast and with other meat dishes. 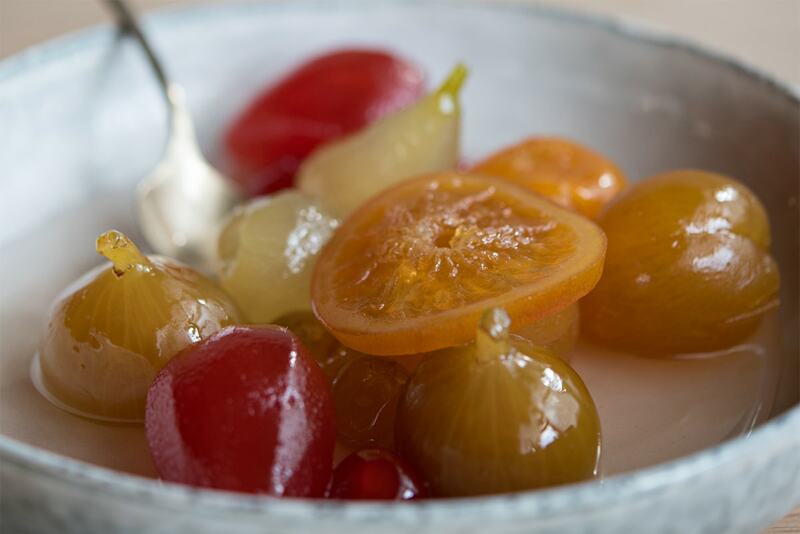 As for any other preserves, mostarda preparation deserves some precautions in order to guarantee its proper conservation and to eat a safe product. Same rules to follow concerning the containers where you will put the products: they need to have some specific features in order to be safe and preserve the preparations. What do they need? They preferably should be made of glass and not too big. It’s better to choose those jars with metal or rubber crown caps, they ensure a better sealing and they keep the product safer. Once you have chosen the proper jars, you have to fill them: this is an essential step in order to preserve the product. Here is a very simple rule to follow: never fill the jars to the brim, allow at least 1-centimeter headspace between the underside of the lid and the top pf the product. Such as jams and preserves, mostardas are long-life products, until the jar stays closed. Whether you buy a pre-packed product or you make mostarda yourself they can stay on the shelves of your cupboard for even a year, if you keep them in a fresh and dry place. Once you open the jar, you need to keep it in the fridge and the life of the product become much shorter. If mostarda is homemade, we suggest eating it within a week after opening the jar, pre-packed products instead can last until 2 or 3 weeks. Mostarda lasts longer than other jams or preserves. Why? Mustard is a natural preservative, that’s why mostarda and the fruits used for this preparation keep their original features for a longer time. A question arises quite spontaneously while talking about mostarda and its nutritional values and calories taken by eating a portion of mostarda. It’s not that easy to exactly determine which are the nutritional facts of mostard, especially when it’s a homemade product. It is true though that mostarda is an accompaniment to other dishes: the necessary vitamin intake can be found in the fruit and vegetables eaten during the day, calories and sugar intake instead are really limited to the small quantities of mostarda used to enrich dishes.